211 Bernard: Must-read: Dept. of Speculation by Jenny Offill! Must-read: Dept. 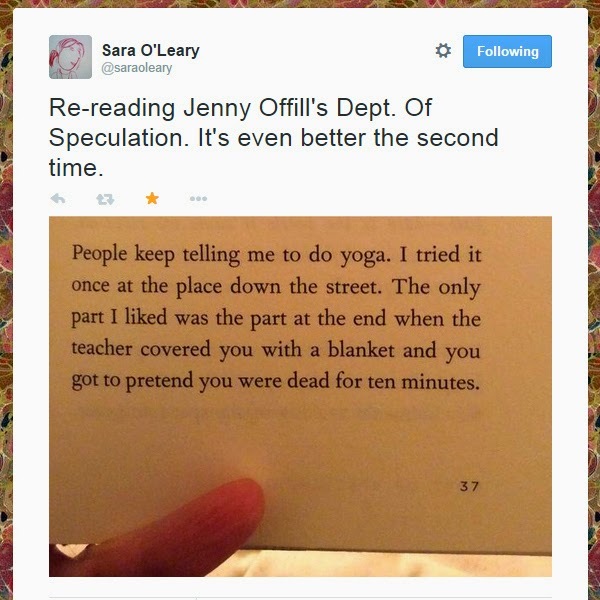 of Speculation by Jenny Offill! Following in the elusive Helen's footsteps, I have also been seduced, at this late hour in the 2014 game, with my top ten already selected, by a beautiful book. Dept. of Speculation by Jenny Offill is straight up amazing, and you owe it to yourself to read it. I read this book in less than a day, I was so immersed in it. It's deceptively short, structured in vignettes and anecdotes that sometimes make you smile, and sometimes absolutely break your heart. And yet it doesn't leave the depression residue I so often feel with heartbreaking books; "a book this sad shouldn't be so much fun to read" is what the Guardian says about Offill's second novel, and they are so very right. This book is mesmerizing: meditative and beautiful, witty and poignant. Offill's narrative voice is so naturally poetic that the images she creates stay with you for days. So in the throes of holiday stress/joy, pick up this gem of a book, and take a few days to drown in some of the prettiest prose that came out this year. Thanks to illustrator Sara O'Leary, whose excerpt tweet made it impossible for me not to read this book.